If you read this blog often, you know that it doesn't feature a lot of high end, upscale restaurants. This isn't by design, but rather by circumstance. For those of you who don't already know this, I'm a barely employed part-time seasonal ticket seller at the FedExForum. 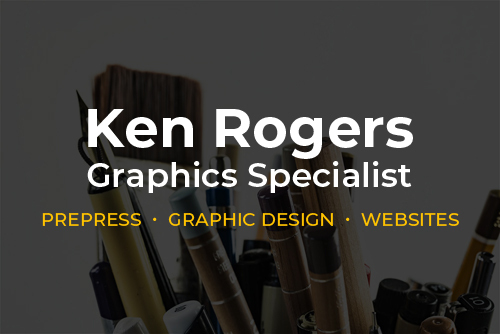 My last full-time job was with a printing and sign company near Millington, Tennessee. 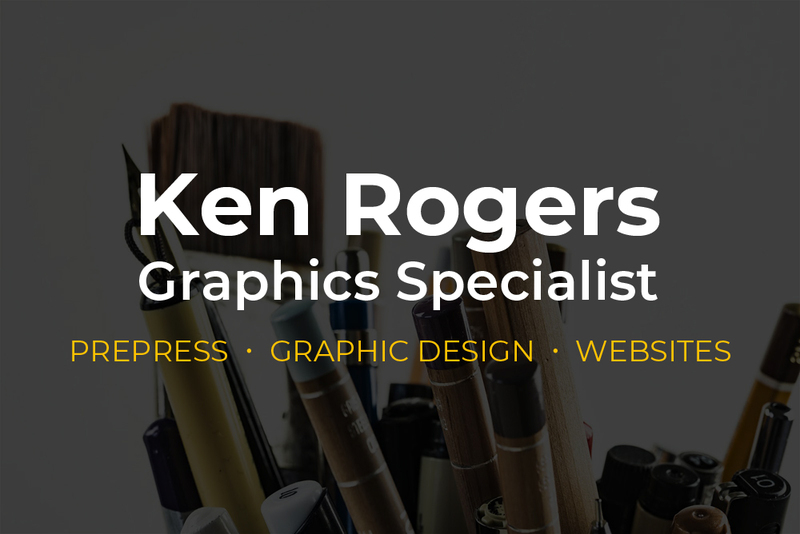 Since my layoff, it has been a struggle to get by. To do it, I've made a lot of sacrifices that included scaling back my dining expenses. As a consequence, I rarely eat at fancy restaurants like the Beauty Shop. However, I try to support my friends whenever possible and Chef Michael Patrick, one of the owners of Rizzo's Diner, is no exception. So despite my lack of financial resources, I managed to make a few visits to Rizzo's. The first visit I made was with my Dad and siblings to celebrate my father's birthday. In deciding where to go for brunch, I managed to convince my sisters to try Rizzo's. They trusted my judgment as a so-called "foodie," but I don't think my taste coincides with the rest of the family. Even though I'm mostly a "meat & potatoes" guy, I'm willing to try new things. Unfortunately, the rest of my family doesn't feel that way. Once my family and I arrived at Rizzo's Diner, everyone's initial impression was positive. We were all impressed by the restaurant's decor and laid back atmosphere, which put everyone at ease. After being seated at our table, we immediately got our menus. When my family saw the menu, it wasn't what they expected. Nearly everyone expected a standard breakfast menu that includes things like pancakes, scrambled eggs and toast. However, Chef Mike (as I and some of my friends call him) likes to be creative with the menu. While I liked what was on it, my fellow family members weren't buying in. Eventually, everyone stuck it out for me because it was my idea to go to Rizzo's. After deliberating about what to order, we all found something that we liked, or so I thought. 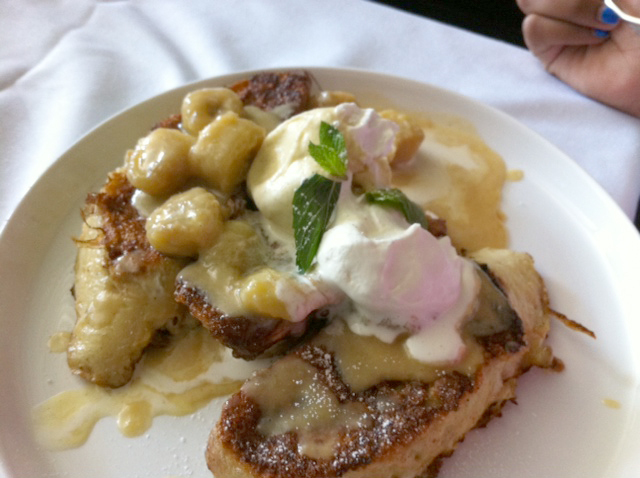 My sister and her daughter got the French toast with gelato, bananas and caramel (I forgot the dish's name; UPDATE: it was the French Toast Bananas Foster). Although my sister had a lukewarm response to it, my niece didn't like it at all. Fortunately, I took half of my niece's French toast which turned out to be good. The French toast itself was a bit difficult to slice yet was chewable. It is sweet with just the right amount of egg yolk in it, which suited me just fine. With the gelato, bananas and caramel, the entrée served as a dessert that satisfied my appetite. Even though I liked it more than either my sister or niece, I can't see myself ordering this as a stand alone meal. However, it could make for a nice dessert that I could share with a companion after finishing our main courses. In that sense, I'm sort of a traditionalist who is not used to having gelato for brunch. Still, for some people, gelato-topped French toast is a perfect diversion from a typical brunch. I had the Blackened Catfish Eggs Benedict. For the most part, the "Benedict" part of the entrée is on par with other places that serve poached eggs. 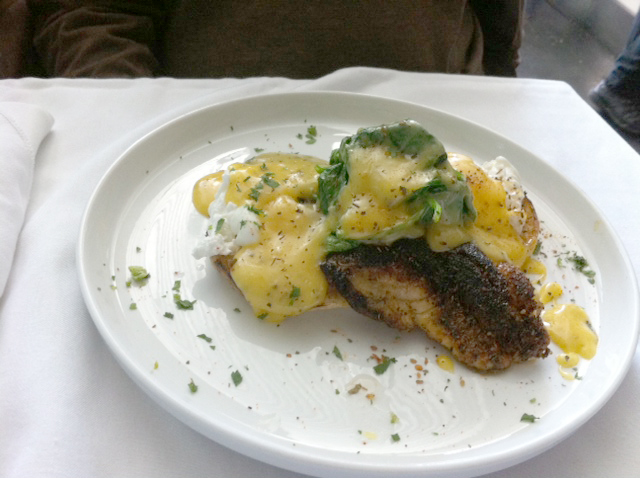 With the blackened catfish and spinach, the Eggs Benedict is a scrumptious dish that I really enjoy. Personally, I believe the spinach adds a nice touch for it accentuates the meal. Although I like it, I want to stress that the entrée is a bit salty. People with high blood pressure may want to take the entrée's saltiness into consideration when ordering it. Other than that concern, the Blackened Catfish Eggs Benedict is a winner in my book. My Dad, who expected a more traditional meal, decided to get the Chorizo Meatloaf Sandwich. When I saw it on the menu, my first thought was "isn't Chorizo a type of sausage?" I should have asked Chef Mike if the meat in the meatloaf was sausage. To satisfy my curiosity, I tasted a small portion of my Dad's sandwich. After sampling the meatloaf, it didn't matter if it had sausage in it or not. The tender texture of the meat is about the same as most meatloaf dishes and the seasonings is definitely Chorizo. After eating a couple of bites, I was impressed and even jealous of my Dad for ordering it. 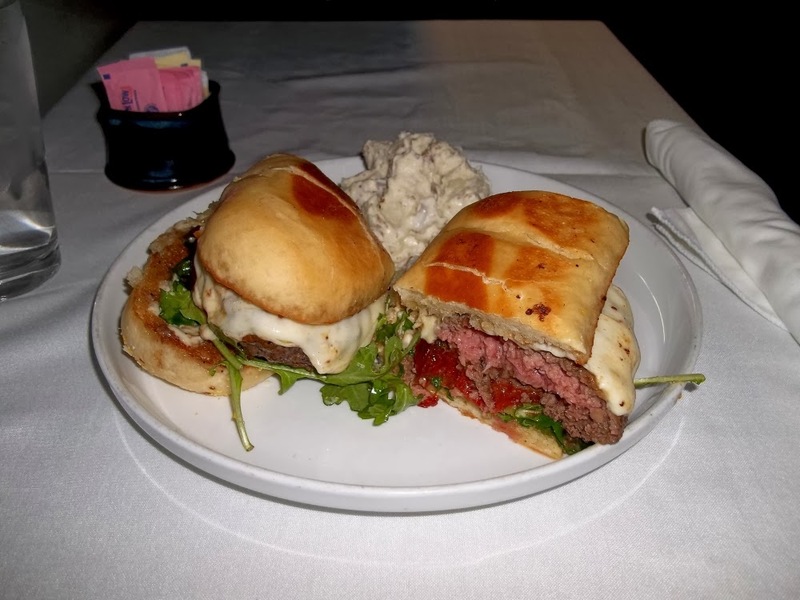 Even though the meatloaf (which can be ordered from Rizzo's dinner menu) is good on its own, the bun used for the sandwich is both buttery and fluffy, which makes the sandwich even better. 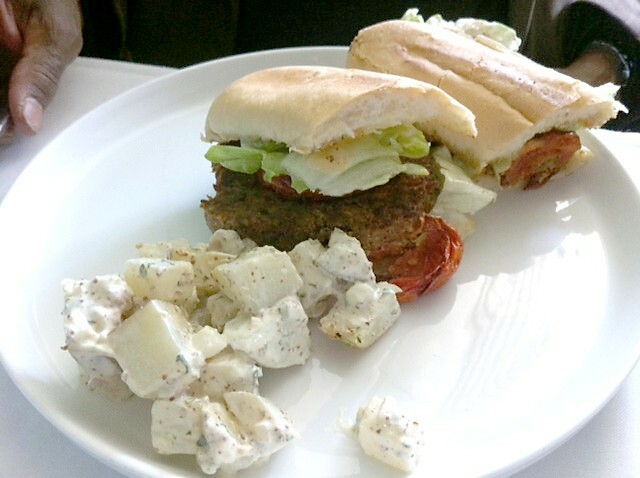 The sandwich comes with a side of potatoes that apparently is marinated in vinegar, which balances the spiciness of the meatloaf. Of the three entrées that we ordered, the meatloaf sandwich was the best among them, in my opinion. Overall, I believe that everyone to some degree (with the exception of my niece) enjoyed their meal. I'm not sure if I could get them to visit Rizzo's again, but I am fortunate that they stuck it out. If I could offer one piece of advice to Chef Mike: never run out of essential menu items. As this relates to my family's brunch, bacon wasn't available that day. Our server told us that the bacon wasn't up to Chef Mike's standards, which greatly disappointed my sister. She almost convinced my Dad to leave Rizzo's for a place more suitable, like the Arcade Restaurant across the street. Fortunately, my Dad didn't want to disrespect either the restaurant or Chef Mike so we stayed. Now, I'm not an expert on running a restaurant, but I've learned from business classes at the University of Memphis (which was a waste of money) that you need contingency plans to deal with unexpected situations. For instance, if your restaurant runs out of bacon during brunch, have a suitable substitute ready to take its place. A few months ago, I encountered a similar situation at Dino's Grill when the restaurant ran out of hash browns. Instead of disappointing patrons for not having it, the restaurant sliced up some potatoes and made something called "home fries" that was even better. With the experience of Rizzo's staff, I'm sure that they can come up with alternatives if essential menu items aren't available. As a new business, Rizzo's Diner will occasionally hit a few bumps in the road, but I hope that it can learn from those missteps in order to provide great customer service. SIDE NOTE: Prior to posting this review, I spoke with Chef Mike about the experience my family had. As it relates to bacon, he said the diner will borrow from the Arcade Restaurant if Rizzo's runs out of it again. That's a good contingency plan, in my opinion. A month later, I visited Rizzos Diner for lunch. After perusing the lunch menu, I went with something simple, the G.E. Patterson Burger. The burger is huge, for it consists of a ⅓ lb. or more of ground beef, lettuce, tomato, American cheese and Italian Dressing within a hoagie roll. When I ordered mine, my server asked me how I wanted it cooked. I don't normally care how my burger is cooked because I want to get the best that the restaurant offers (e.g. a Soul Burger from Earnestine & Hazel's). However, when asked, I request the kitchen to cook it medium rare. By having meat cooked a certain way is a good indicator of a restaurant's competence. In this regard, Rizzo's delivered, for the burger patty was a perfect light pink inside and very tender. The beef is lightly seasoned, and overall the burger was okay in terms of taste. With the Italian dressing, the burger was a bit messy but I managed to eat it. While the G.E. Patterson Burger was far from the best cheeseburger I've had, I can see myself ordering it again. For my next monthly visit, I stopped by Rizzo's Diner for dinner. One of the reasons that I chose Rizzo's was for the Lobster Pronto Pups that I heard so much about. The "pups" are lobster pieces battered in a flour mix that's similar to what is used in tempura recipes and skewered on sticks. Setting atop a bed of "greens" (not quite sure what the vegetable was, although it was probably arugula) and garnished with Dijon mustard aioli, the pronto pups lived up to the hype in a big way. The taste was "a little more tempura than corn dog," to quote Kerry Crawford from the blog I Love Memphis which I happen to agree with. The aioli added a tarty sweetness that made the pronto pups a delight to eat. My only regret was that I didn't have this sooner. Kudos to Chef Mike for creating a wonderful dish. After finishing the Lobster Pronto Pups, I was ready for the main course. 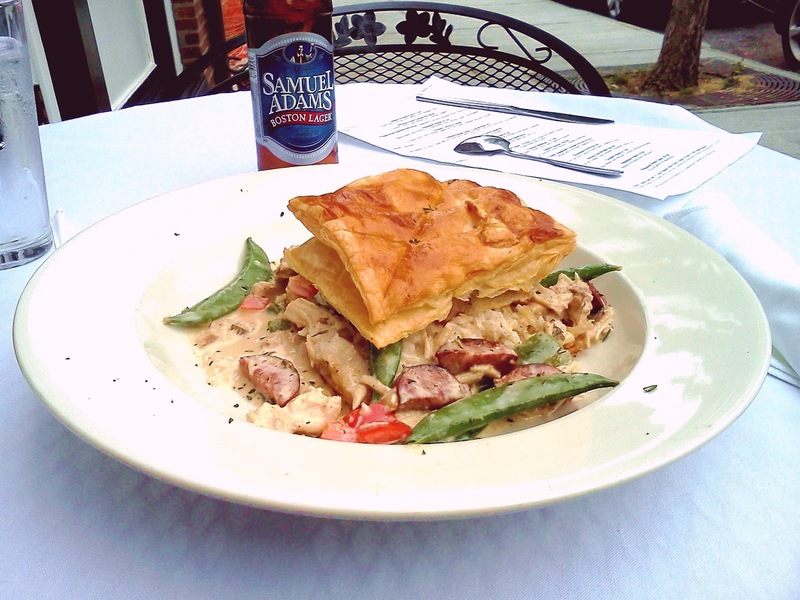 I chose the Cajun Seasoned Chicken Pot Pie. Even though it is called a "pie," entrée looks more like a huge sandwich stuffed with chicken, Basmati rice, snap peas, red and green peppers and Andouille sausage. All of this was immersed in a cream sauce and within a pastry that was flaky and buttery, perfectly suited for the entrée. 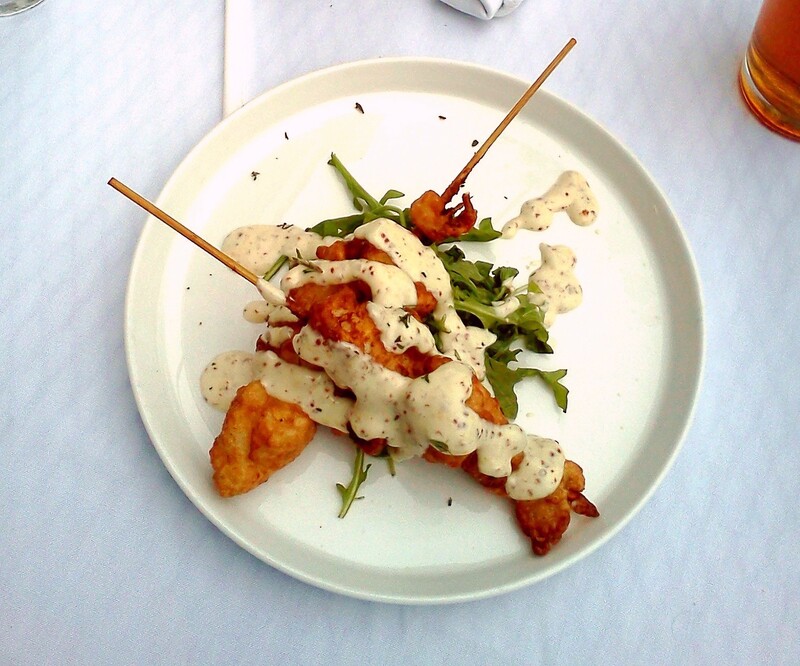 In all, it had the spiciness that one would expect from a Cajun dish with the ingredients meshing nicely. The entrée was great for I thoroughly enjoyed it. From my three visits to Rizzo's Diner, I came away impressed with every meal that I had. Chef Mike really put a lot of time and preparation in developing the concept for the restaurant, and now it's paying off. I believe the restaurant is destined for long term success if it continues to keep up the good work. I'm sure the diner will make mistakes along the way, but it's all part of the learning process that will make it a great restaurant for years to come. I hope that I'm fortunate enough to be a part of it.